Blog home»Are Ionophores a Risk for Antimicrobial Resistance? Are Ionophores a Risk for Antimicrobial Resistance? This article written by Dr. Reynold Bergen, BCRC Science Director, originally appeared in the June 2015 issue of Canadian Cattlemen magazine and is reprinted on the BCRC Blog with permission of the publisher. Last month’s column talked about Health Canada’s initiative to phase out growth promotion claims for medically important antibiotics by December 2016. This will impact three antibiotics (tetracycline, sulfamethazine and neomycin) that have growth promotion claims in beef cattle in Canada. It will not affect ionophore antibiotics like Rumensin, Bovatec, or Posistac. Ionophores are used widely in in beef production because they reduce methane production, allow the rumen to use feed energy and protein more efficiently, reduce the risk of bloat, acidosis and liver abscesses, and help prevent coccidiosis. Ionophores are not used in human medicine, so they are not considered to be medically important. They are also not a concern from an antimicrobial resistance perspective. Here’s why. This post was written in collaboration with Kathy Larson, MSc, PAg, Beef Economist with the Western Beef Development Centre. a) INCREASING – conception rates, weaning rate, etc. b) DECREASING – calf death loss, calving span, etc. While it is good management to track and calculate one’s herd production performance indicators on an annual basis, it can be helpful to have benchmarks to compare to. Benchmarks help a producer know if they are on the right track. They can help a producer identify if they excel in a certain area and/or could improve in another. They can also help to show what production and management practices other producers are following. Benchmark productivity measures for the cow-calf sector can also help guide research and extension efforts. For these reasons, a group of individuals from British Columbia to Manitoba, representing provincial beef producer groups, provincial Ministry of Agriculture specialists, the Beef Cattle Research Council, Canfax and the Western Beef Development Centre have revived, expanded and conducted a survey last conducted in Alberta in 1998. It is essential to harvest forage at the best time, from the point of view of nutritional quality, quantity available and climatic conditions, and then to store it properly to reduce losses. The objective of harvesting forage for storage is to preserve forage produced in the summer months in order to ensure winter feed for livestock when grazing is not feasible or accessible. Hay uses desiccation or dry storage containing less than 15% water to prevent spoilage. Silage or wet storage uses the acidifying power of lactic bacteria, which reduces the pH to around 4, below which all chemical reaction and fermentation ceases. Haylage usually refers to a crop that is wilted to 60% moisture and is stored in oxygen limited structures or plastic bags. Limited haylage is produced in North America due to material handling problems, however it is very popular in Europe. Hay baled at a high moisture content will spoil and mold. Silage must be firmly packed to minimize the oxygen content or it will spoil. Silage can be successfully made from any green crop that has sufficient water-soluble carbohydrates and appropriate moisture content.1 In regions where frequent rain has a high risk of reducing hay quality, silage is a better option for storing forage nutrients. 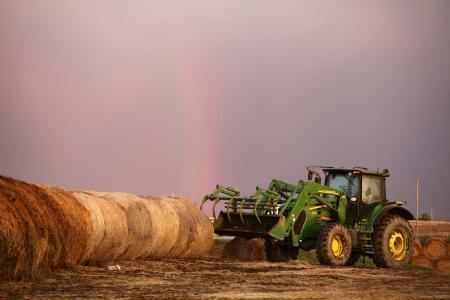 In regions that are dry and have challenges with targeting 68-70% moisture in silage after wilting due to high evapotranspiration, hay is preferred assuming the same forage is used with comparable quality and yield.